I’ve always been fascinated by how countries often seem to have their own sound. Just as Norway is the cradle from which Black Metal comes, so is Finland synonymous with Folk Metal, with the Finnish Metal scene being ablaze with some of the great names of the genre. And all too oft we tend to focus more on these shining examples, overlooking other bands who haven’t made it that far yet. WOLFHORDE are exactly one such band, steadily clawing their way out of the underground, with their recently released second full-length album “Hounds of Perdition” as their latest offering. Just shy of three quarters of an hour, this album packs 7 songs and a whole slew of influences, ranging from Symphonic to Heavy Metal to Power. But my first impression of “Hounds of Perdition” was the album cover. Whilst it at first glance has a wintery post-apocalyptic feel to it, on closer inspection, it seems to be a bunch of elements haphazardly thrown together with only tenuous ties to each other. However, the same can sadly be said about a significant part of the album. The first five songs feel like a hodgepodge influenced by other bands, and it is only in the last two songs that seem completely original. Starting off their album with a long song, “Chimera” is exactly as the name seems to imply; an amalgamation. Starting with a soft, lilting introduction, this song gradually shifts into a slow chant, which in turn slowly swells before bursting with a more epic sound. This again merges into something altogether darker and more twisted, seeming to herald an approaching doom. So far so good. But this is where things start to become unoriginal. Parts of this song have a very later-day ENSIFERUM-ish feel to them, whilst the more melodic parts seem to have almost a touch of WINTERSUN or perhaps bring back memories of the Jari days of ENSIFERUM. The next song “Doctor of the Plague” is a rather rambunctious melody which in some ways brings to mind the snazzy humour of FINNTROLL. This carries over to “Black Song” in which a lively melody is accompanied by a vocal style more commonly found in Power Metal, sounding like an odd mixture of FINNTROLL and TWILIGHT FORCE. “Towers of Silence” follows much in the same musical vein, before “Forged in Ice” returns to early ENSIFERUM. “Kill the Light” is perhaps the most original song on the album, showing what WOLFHORDE is really capable of. It has everything from catchy yet chunky guitar parts, maelstrom-like solos, and up-beat clean vocals. The album finally ends off with the eponymous “Hounds of Perdition”, which again sees WOLFHORDE in their element. With over 11 minutes worth of song, WOLFHORDE take time to go into everything from melancholic melodies to Heavy Metal influences coming to the fore. Chanted sections give the song a final flourish, bringing the album back full-circle to “Chimera”. 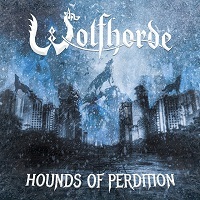 On the whole, WOLFHORDE certainly don’t lack potential, and deliver a solid album with “Hounds of Perdition”. One of the things I loved about this album is the bass. All too often, the bass get lost in the background. However, in “Hounds of Perdition” the bass is put to good use, giving the songs more impact. This is in even starker contrast when compared to the often filigree synth sections, with some excellent mixing done during the production stage. But I somehow feel that this album is very much personified by opener “Chimera” insofar as it is largely a mixing pot of different styles, which can be good, but can also misfire. It’s very rare for me to drop names of other bands in a review, as I feel a band should be judge on its own merit rather than be compared to others. However, here I can’t but help draw comparisons time and again. It’s only in the latter part of the album that we see what WOLFHORDE can do when not directly drawing influences from other bands, and it is hear that we see their own quirky sound come to life. If you're a fan of the above-mentioned bands, then you might quite enjoy this album. However, if you're looking for something with an original sound, then this might not be what you're after.